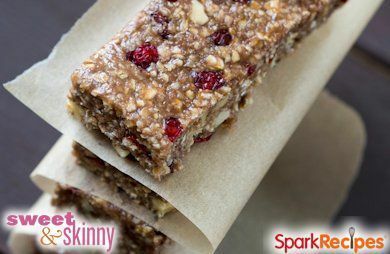 This recipe is simple to make, and a great way to make a healthy granola bar that isn’t loaded with sugar. Kids and adults alike love these Omega-3 rich granola bars. This recipe is simple to make, and a great way to make a healthy granola bar that isn’t loaded with sugar. Kids and adults alike love these Omega-3 rich granola bars. Preheat the oven to 375° F. Lightly grease a 7x11 pan and line the bottom with parchment paper; set aside. Spread the oats, flax seeds and almonds out on a baking tray. Toast the ingredients in the oven for about 8 minutes, or until fragrant and the nuts are golden. Meanwhile, pour the brown sugar, apple juice, honey, oil, vanilla and salt into a large pot and cook over medium heat. Allow the mixture to simmer for about 10 minutes, until thick and syrupy. Remove from the heat and pour the remaining ingredients into the pot and stir to combine. Transfer the mixture to the prepared pan and press it into the pan with a spatula. Work quickly; it will set up fast. Allow the bars to cool for about 20 minutes. While they are still slightly pliable, cut the bars into 12 pieces and wrap tightly. Store the bars at room temperature for up to 2 weeks.